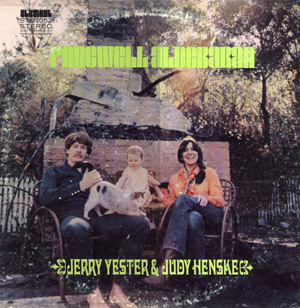 As long as I'm on the subject of Daughters of Albion again (see Thursday's post) I may as well mention Farewell Aldebaran by Jerry Yester and Judy Henske, which is yet another great semi-lost folk/psych/unclassifiable classic. Interestingly, there's a Frank Zappa connection for both bands. Farewell Aldebaran came out on Zappa's Straight label (also home to early Alice Cooper and Captain Beefheart) and Kathy Yesse of Daughters of Albion subsequently released a (not very good) album on Zappa's DiscReet label. Go Frank! Farewell Aldebaran is still non-CD, which is really irritating in this age of iTunes. I'm pretty sure that it hasn't even come out in Japan, the glorious country that's largely responsible for preserving America's musical heritage. It's not that Farewell Aldebaran exactly sounds like Daughters of Albion. DoA is poppy and catchy, Farewell is kind of all over the place stylistically and much less radio friendly (not that DoA probably got much radio play). Both albums start with folk informed by rock, and then do all sorts of unexpected things with production and arrangements. Farewall Aldebaran is more traditional in some ways and more out-there in others. Sorry to be so vague, but it's kind of a tough record to explain. If it got a rerelease today, it would ideally be on Drag City. How's that? The best example of "unexpected things with production" is probably the title track from Farewell. Tell me what you make of this. The problem with putting this album in an mp3 blog is that no two songs really sound alike, so giving an overview is somewhat pointless. Here's the album opener, Snowblind, and here's The Three Ravens (I'm going to go out on a limb and speculate that Damon & Naomi pray in the direction of this song several times a day). I'd guess that you'll know at this point if you want to start trolling gemm for a used copy. Judy Henske is still around and active, and it doesn't seem impossible that this album will get a CD reissue...eventually. A great fan page is here, and here's Judy's official site. Be aware that Farewell Aldebaran is a unique item in the catalogs of both artists who made it, much like the Daughters of Albion album.